Android Auto. It’s Google’s answer to Apple’s Car Play, and it competes for your attention if you have a modern fancy car with a swanky large screen display so you can drive more smoothly. Of course, to use Android Auto in the past, you needed one of these modern cars. But no more. Google is opening up Android Auto so it works on your smartphone as well as in-car displays, opening up the experience to millions of “older cars,” too. You can see an image of what this looks like at the end of this article. 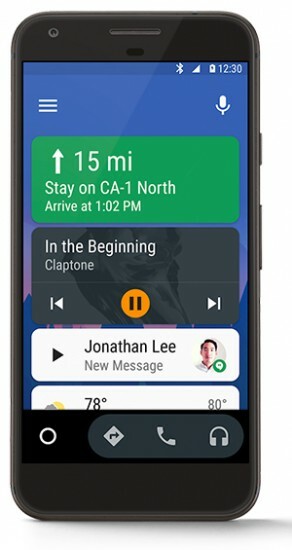 “Whether your phone is connected to a compatible car display, or placed in a car mount on the dashboard, Android Auto brings your favourite apps and services into one place, making them accessible in safer and seamless ways. You can bring your music with you with apps like Spotify, Pandora or Google Play Music, and make calls or send messages with hands-free voice commands. And of course, get turn-by-turn directions to your next destination with Google Maps. This update also brings the ability to automatically start the app when the phone is paired with Bluetooth. While you can put your phone in any car mount, please keep an eye out for Bluetooth-supported car mounts such as Logitech’s SmartCar mount, which is coming soon to the Google Store and select retail locations. Schobbe concludes by noting that the latest 2.0 version of the Android Auto phone screen experience “will be rolling out in the coming days to more than 30 countries where Android Auto is currently available”, and that if you want to receive an email when the update is available for your personal Android 5.0 or better smartphone, you can sign up for the notification service at the Android Auto website here.